IAP2 Membership offers you the unique opportunity... to connect with national and international experts and with a huge community of practitioners in your own region; to learn from the ONLY industry association dedicated to community engagement, and to be recognized as a specialist practitioner by government and industry. Take the opportunity to serve on committees that further develop IAP2 regionally and around the world. Click here for the Membership FAQ. You can JOIN US in our efforts to engage people in planning and public policy decisions that affect everyone. 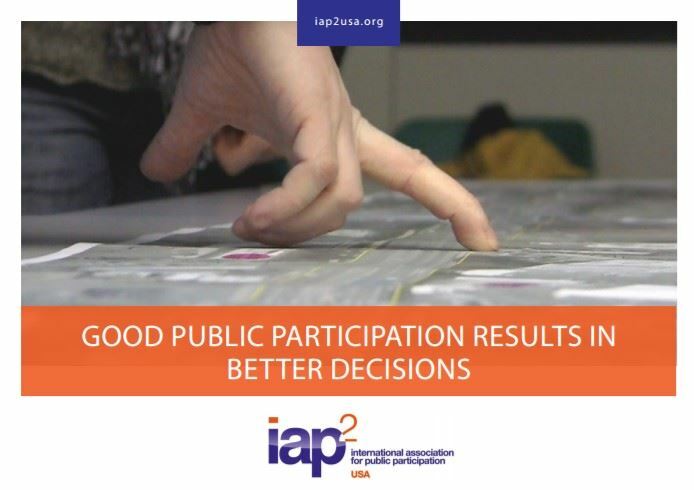 IAP2 USA is a 501(c)(6) professional organization that leads, advances, and advocates for best practices in public participation. Learn more about our vision and mission.